I just wanted to thank you for taking the time out of your busy schedule to speak to 160 students in Melbourne Jan. 13. You may never know the full fruit of your actions, but chances are you inspired a child to pursue a career in science, technology, engineering, math, or a space-related field. Outreach into our community is paramount to ensuring the next generation of engineers and scientists- and tht we show them what the possibilities are, and that they too can acheive great things. Without the support of you, and others like you, the Speakers Bureau would not exist. I truly thank you for your continued support and dedication. Gabe, thank you so much for inspiring our students to Ågreach for the stars.Åh We enjoyed your presentation tremendously and canÅft wait to have you return. Please let us know when you will be coming to the Lakeland area again. Thanks againÅ\it was a pleasure meeting you! Just wanted to say thank you for permitting our school to be able to observe and participate with Mr. Gabe Gabrielle during the NASA presentation. The children really enjoyed having such a great speaker. Mr. Gabrielle is very expressive and it helps the children keep focus when he was speaking to them. Thank you so much for coming to Palm Bay High. A large number of kids came up to me in the afternoon and asked why they werenÅft allowed to come and hear your presentation. All the kids said it was cool and those not attending felt left out. I told them that we may be able to do it sometime next year and hopefully their teachers will let them come. In my opinion, that is a huge compliment. Again, thank you so much for coming to our school and I will keep in contact with you! My class really enjoyed listening to Gabe explain NASA and see pictures and videos of the space shuttle. He was able to hold their attention and encouraged all of them to be attentive in school so they can do whatever they want to do when they are older. Thanks for this great presentation! I just wanted to let you know just how much we appreciated Gabe and the FANTASTIC presentation he did for our students at Frost Elementary. He was inspirational, informative, and most of all so relateable to the children. Both my class and I really enjoyed the pictures, video clips, and wealth of information Gabe provided. He is such a kind man who really seems to love what he does!! You are lucky to have such a passionate employee, and we were blessed because you shared him with us. Once again, Thanks to you and Gabe! The students loved the presentation. It was excellent with the visuals, explanations, and videos. They also learned a lot and got excited about the space program. Gabe gave an excellent age-appropriate presentation to the students. I would recommend him to any teacher. Mr Gabe Gabrielle came to visit our class 11/17/2010. Please thank him for coming. My students really appreciated all the valuable information and goodies he brought for them. The photographs of live space shuttle lift offs were simply amazing! Again we thank you very much! I just wanted to thank you for taking the time out of your busy schedule to speak to more than 400 students in Lakeland Jan. 11. You may never know the full fruit of your actions, but chances are you inspired a child to pursue a career in science, technology, engineering, math, or a space-related field. Gabe was SUPERB! All of our students from the academy and the main campus are still talking about him and want me to bring him back. This is a total of 650 students. He was AMAZING with them! Thank you for sharing this treasure with us. Thanks so much for coming on Wednesday and speaking to our Earth Space Science students here at Kathleen High School. IÅfve heard good feedback from the students I have spoken with. They enjoyed hearing about the programs NASA is involved with and how the astronauts train. You planted a seed that hopefully will germinate and encourage some of our students to pursue their dreams and strive to achieve careers in science and technology. Thanks also for including me on your NASA mailing lists. I appreciate the information you are sharing with us. On behalf of all of Riverview Elementary School, I would like to thank you for all of the time, effort, and energy that you have given to our little school. You have a special way about you that reaches children's hearts and enriches their minds. You are one of a kind! Once again, I wanted to thank you for taking the time out of your busy schedule to speak to 250 students at two schools in Tampa November 18. You have proven to be an invaluable resource to the Speakers Bureau, and the community. You may never know the full fruit of your actions, but chances are you inspired a child to pursue a career in science, technology, engineering, math, or a space-related field. I can't tell you thank you enough for visiting us yesterday. EVERYONE who listened to the assemblies have raved about how wonderful it was. Our Assistant Principal and another First Grade Teacher (both with 25 years of experience) said it was the BEST assembly they have EVER seen! Everyone at LAE is singing your praises! FYI...If you are assigned to us next year, I have revamped my program so that you will have an hour and a half! Thanks again! You made such a lasting impression on these kids! Thanks so much for visiting our school and sharing with us. Our students are so excited about space now! Your presentations were incredible and informative. I can't express to you how extremely thrilled we are with your visit! Mr. Gabrielle spoke to our students, grades 2-8. He did a great job of connecting with the students, keeping their attention, motivating them to listen and never lost his enthusiasm for the two hours he presented. We appreciate his time and learned so much. He certainly sparked an interest in the program. We just want to thank you for letting George Gabrielle come to our school to inform us on everything going on at NASA. It was really 'mind shattering' realizing that there's a whole new world out there, waiting to be explored! "Thank you, you gave us more knowledge." "We never really knew what space was like - now it is different. Knowledge is power." "Very interesting to see how they made the space shuttle." "Thank you for encouraging us and telling us that a lady can become an astronaut as well." As you can see, we really enjoyed it and can't wait for the first of November to see the launch! Gabe did an excellent presentation at Hoogenhout High School, Mpumalanga, South Africa. The subjects Science, Mathematics, Geography and Technology are those subjects which will be the first to benefit by his visit. He also gave patches and a folder with a CD and other information to me to distribute. (The kids loved this as it was a reminder of his visit and what he said as motivation). Gabe spent another hour on answering various questions regarding the NASA programs, launches, life and research on the ISS. He also had the opportunity to have one on one conversations with some of the pupils - something I haven't seen at this school in the 10 years of teaching here! A true compliment for the positive rapport that Gabe established with the teenagers during his presentation. (All the pupils in the school have English as a second language). Quite a few expressed the wish - would he be able to visit us again?! Thank you for giving us the opportunity to meet this remarkable man! The Spaceman came to our school! We really enjoyed the NASA presentation at Valleyview Elementary! Even the kindergarten kids were enthralled. The photographs were amazing and we followed up with library books with similar pictures. I may even have a budding "astronaut" in my class. Thanks again for your presentation. Valleyview Voyagers Always Aim for their Best and Never Settle for Less! On May 21st. Gabe brought N.A.S.A. To Garner Elementary School's 800 students. Gabe's presentation was fantastic. His awesome power points and picture shows captivated kindergarteners through fifth grade. Gabe's motivational speech was fascinating. Garner Elementary is in Winter Haven, Florida. Our school is in a very high poverty area in Polk County Florida. Most of our students will never know life outside of a text book or be able to escape the poverty stricken area. When I first met Gabe and learned it may be a possibility for Gabe to present at Garner, I shared with him my burden for the children. Many of the children are too old for their current grades due to FCAT retention. Many of our fifth graders are simply given up on life already. Gabe mesmerized the children during his day long guest speaking engagement at Garner. Gabe was able to speak to individual classrooms throughout the day. The children responded to Gabe with sincere questions and later through sincere letters of appreciate with yet more questions. Thank you for allowing Gabe and N.A.S.A., to enter the hearts and minds of Garner students. This was a true mountain top experience for the Garner children and their teachers. P.S. Not only was Gabe amazing, he brought gifts for each of Garner's 800 students from NASA. The students now own a bit of N.A.S.A. Through Gabe's guest speaking and his gracious gifts. Gabe will live on in these children's minds and hearts forever. Gabe came to our Valleyview Elem. and did a wonderful presentation for our students. It really helped to cement the things we had learned about in class and of course the up close pictures were awesome. His explanations were understandable for our students and he was very patient with their questions. Naturally the students were thrilled with the handouts that they got to keep. Several of the parents have asked about the presentation. Apparently it ended up being dinner conversation. When something stays with them all the way to the dinner table then you know it has been a success! Thank you for sharing Gabe and his vast knowledge with our students and allowing them to have this wonderful opportunity. This is a long overdue, BIG Thank You on behalf of the faculty and students at Valleyview Elementary!! They enjoyed the slide presentation and it's always exciting to see their enthusiasm and listen to their questions. Thank you too for the DVD's for the teachers, as well as the pictures, pencils, stickers, etc. that you left for the children. I have forwarded your email to our teachers to share with their students. They will enjoy the updates. We consider it a privilege to have speakers who give their time to come to schools to encourage and educate the children. Feel free to continue with the updates. I can't tell you how I appreciate coming to know Gabe and for his agreeing to enter the lives of Garner's 800 students. I am thankful that N.A.S.A. has made possible your speakers bureau in which N.A.S.A. 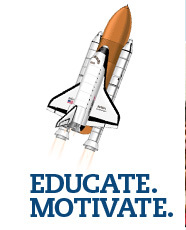 Employees can share dreams and goals of the aerospace program with students. My kindergarten students will never forget Gabe. When I showed my students the pictures that were taken by my husband, they were mesmerized all over again. These are a few comments following Gabe Gabrielle's presentation at Gray's Creek Elementary School (Hope Mills, NC) on Friday, May 28, 2010. "At Gray's Creek Elementary School we were excited to have Gabe Gabrielle as our guest. We learned so much from him, like where and how a space shuttle is put together; how astronauts train for their flight to space and how to live in space; and even interesting things like how astronauts eat, clean themselves, and use the bathroom! We loved the movie clips, too. Gabe was very patient with the children, and he explained space flight in very understandable terms to the students. He encouraged everyone to NEVER give up their dreams, and especially encouraged the girls to be interested in science-related professions. Gabe's love for space was really inspiring, and we were very lucky that he visited us from out-of-state." Gabe's presentation kept their attention and the students were engaged in what he was explaining. They really enjoyed the movie clips, especially about how to use the bathroom in space! Many students asked questions at the end of the presentation and wanted to continue with the discussion although we were out of time. His interactions with the students were inviting and the students felt comfortable with his encouragement to set goals and follow their dreams. He shared his experiences with making goals and following dreams while showing the students pictures from his adventures in South Africa and how he helped students in South Africa to achieve their goals of coming to America and visit NASA. Gabe was very honest about his experiences and shared with the students that it is ok to make mistakes as long as we learn from them. We would like to have him visit our school again next year. He is a great speaker! I am writing to let you know that Gabe was at our school on May 10, 2010 and gave a presentation to our science students. There were approximately 500 students present for a one hour presentation and it was almost another hour of answering their questions. An excellent presentation and an excellent response from the students present. Thank you for this opportunity for our students to learn. Hi I am Kym McCall and was one of the teachers classes that Gabe got to visit after his large group presentation. My kids loved the videos and the information about the space station and were amazed at how much fun the astronauts were having. My students had a few idea to help improve the presentation. they thought one big presentation with all the different parts in it would cut down on the not being able to find pictures and videos . As for the one on one time that my student had during my classroom visit, the topic of goal setting and "picking something to do" was great for my freshman. I had a SPED integrated class that period and it was nice to have someone saying the same thing I had been telling them all year. Something is better than nothing. Get a dream and start to chase it. Thanks for the time and the very interesting presentation!!!! THANK YOU! Everyone enjoyed the presentation and we are so very grateful that you took the time to come and visit our school. The kids truly enjoyed it and so did the teachers. Thank you for the sweet comments and I apologize I had to cut our conversation quick. Unfortunately I had a meeting I HAD to attend but would rather have stayed back and talked with you more. We will have to do this again next year! Keep in touch and enjoy your summer! Gabe, We had a fortunate Pre-K friend that was able to attend the recent launch and was able to fill in some cool details!! We thought you'd like to know what an impact your visit made to our Pre-K friends.... Wish you well. I wanted to take a moment to thank you for allowing George "Gabe" Gabrielle visit our school on April 15, 2010. He made two presentations at our school that morning (Grades K-2 and 3-5) and discussed many different facets of the NASA facilities and projects including the shuttle program, the International Space Station, the Mars Rovers, exploring Mars, and the future of the space program. I think it's safe to say that we very rarely see our students so quiet and engrossed in a lesson as they were that day! That Gabe would take time away from his position with you to come and speak with students so far from his home says a lot about how dedicated to NASA he is and about how much he loves his job! The students also loved the gifts he brought! Please send our thanks to the appropriate department for providing our students with these lovely memories of their NASA lesson. Once again, from the entire Spessard L. Holland Elementary School family, we thank you for letting Gabe come to our school and make his presentation. Thanks for sending Gabe to speak to our school about the Space Program at N.A.S.A. He gives a truly fascinating presentation that mesmerizes and captures the imagination of all the students in our school, from Kindergarten to 5th Grade. 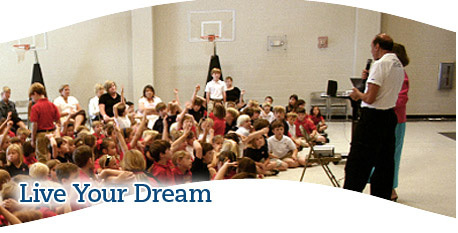 He encourages the kids to live their dreams and believe in themselves to reach their goals. I am sure many of these children will grow up to pursue careers in science and aerospace technology, or have a greater appreciation of the space program and everything we have gained from it from Gabe's educational and motivating power point display. He also made sure he had enough "goodies", such as pencils and tattoos for every child in school. Not only has he done this for our school, but he has gone out of his way to do special things for a child in my class who has been receiving treatment for a rare type of brain cancer the entire school year. He has bought her a teddy bear from N.A.S.A., a star in her own name, and arranged for her family to visit Kennedy Space Center. The most amazing thing about all this is she had the visit as a Make A Wish desire before he even knew about her. He has also mentored 3 of my students who have had difficult times in the classroom in previous years through the school's e-pals program and has changed their lives for the better giving them better attitudes towards themselves and school. One of the children was constantly in the principal's office last year and now has been virtually a model student with his behavior this year. Gabe has been so wonderful and inspiring to everyone around him and I thank you so much for allowing him to visit schools and share his gift of knowledge and motivation to so many others. I was given your email address by Gabe. He asked if I would tell you how his speaking engagement at our school went last Friday. Well, he was fantastic! Gabe presented to all of our 5th grade classes at DSA. He also gave a second presentation to the Kindergarten classes after our presentation. The children were actively engaged in the presentation for almost one hour. Gabe's Power Point presentation was phenomenal. He had slides and movies. The kids really enjoyed the explanation about how the bathroom works ? I just wanted to brag on him a little bit ? Our students asked if they could write him thank you notes ? Have a great day!! Thank you so much for coming to Welch!! We really enjoyed your visit as it was very interesting. The children couldn't stop talking about it when we returned to the classroom. The pictures were wonderful. Thank you for taking the time to share your knowledge with us here at Welch. Good Afternoon, My name is Katie Lowrie and I'm writing in regards to the presentation by Gabe on 2/2/2010 at the Coweta County Science Fair. I truly enjoyed Gabe's presentation and, more importantly, I feel the students were actively engaged and truly got a lot out of it! He pictures were unique and his stories and knowledge really help the student's interest. I was chaperone to high schoolers and usually it takes a lot to get them excited. They were talking about the presentation all the way back to school on the bus! I would love to hear him again and I really appreciate Gabe taking his own personal time to come and visit our students. On Tuesday, February 2, 2010, we had a grand time during our presentation with Mr. Gabe. He shared lots of information with our students concerning the NASA program and also taught them many things that they didn't know. The students were very attentive and asked lots of questions regarding the presentation. All in all, Mr. Gabe did a swell job in presenting to the students and letting us know what NASA is all about. I am a fifth grade teacher at Welch Elementary. Gabe presented to our school last week, and did a great job! The presentation got my students excited and held their attention. At times, he was a little difficult to understand clearly because of the pace of his speaking. However, I would LOVE for his presentation to be one repeated at Welch. Thank y'all so much! Good morning- I am a fourth grade teacher at Welch Elementary, Newnan, Georgia. We had an awesome presentation done by Gabe. The kids were so amazed at the power point slides he showed. He is a great speaker and motivator of students. I appreciate his willingness to come and speak to children. Gabe spoke at our first county science fair recently (2-10-10). We appreciate him taking the time to share his life experiences as well as presenting a phenomenal slide show to the students. I believe that he sparked an interest in many future aerospace engineers. Thanks GabeÅc. Welch Elementary School was honored that Mr. Gabe came to our school. Our fourth and fifth grade students and teachers thoroughly enjoyed the presentation. Thank you very much for allowing Mr. Gabe to share NASA pictures and information with our students and staff members. Please think of us in the future if you are presenting programs to schools in our area. On behalf of the teachers and students, I wanted to thank you for coming to our school last week. We absolutely loved the presentation. One of the teachers said, "It was the best presentation I've seen yet." The movie clips were amazing and the pictures were vivid, easy to see, and inspiring. Gabe did a fabulous job of presenting a lot of pertinent information in a little amount of time. The students were completely enthralled with all the facts, especially about how astronauts use the restroom in space!!!!! One student said he was fascinated by the animation of the Mars Rover. Another said that watching the boosters fall off during launch was awesome! They also loved hearing about his experiences in Africa. This student was inspired to do the same thing, one day! We are also very thankful for all the goodies! Each student immediately put their pin on their jacket and the sharpened their pencil. They have been enlightened in a subject that is very far removed from their every day life. Continue your wonderful program as long as you can. We loved hearing it and would love to have him back next year!!! Thanks for the opportunity!! "To Infinity and Beyond!!" Thanks for sending this, I will pass this on to our 5th grade team. Thanks so much for speaking with our students. They absolutely enjoyed your talk! What a pleasure it was to have Mr. Gabe visit our fourth graders at Yates Elementary. We all thoroughly enjoyed his pictures, videos, and knowledge about space and NASA. The students were so excited the entire time and talked about his visit all week. They also were so grateful for the gifts he gave them all. Bravo to NASA for sharing such a wonderful speaker! Thank you again. We look forward to a visit from Mr. Gabe next year. The students and teachers loved your presentation! They couldn't stop talking about it on Thursday. Thank you so much for taking the time to visit our students. They are so much better for it. I will definitely relay the message to have the teachers send emails on your behave. Again, thank you for such an awesome presentation!! Hope to see you again next year!! Keep up the fantastic work. My class and I enjoyed your presentation on Wednesday, especially the photos and videos! I teach 3rd grade Math and Science at Cannella. Thank you so much for visiting our school today. I would very much like to be added to your e-mail list as I am just as fascinated with the Space program as my students are. Thanks again! Gabe was fantastic in his presentation. I enjoyed it as much as the kids. Hope he could do it again in the coming years. Students were in awe when we went back to the room and discussed a lot of the things presented. We had the pleasure of having George Gabrielle "Gabe" come to the school today for our 4th and 5th graders, and it was absolutely fantastic! I was wondering if there was a speakers evlauation form for me to fill out in order to send my praises on about Gabe. Thanks! George "Gabe" Gabrielle came to my Career Research class Wednesday, October 28 and gave a very interesting presentation about NASA and where it's heading. The students were fascinated by the pictures/movies he showed. He shared some good life lessons as well as planted the seed of interest in joining the work force that goes into the space program. He also brought all types of goodies that I distributed to my students as well as students outside my class. Mr. Gabrielle came to our school and shared some exciting Science information and slides with our students. Let me just say, these disadvantaged youths could not get enough of his visit. After his presentation my 4th grade class didn't want to leave. What a fantastic experience this was for them. I am looking for some materials and resources myself to enrich my students. Thank you for allowing him to visit and expose our students to NASA. I want to take this opportunity to tell you what a wonderful job Gabe Gabrielle did speaking to my students on January 11th in Clearwater, Florida. His presentation was very educational and presented in such a way that our mentally disabled adult students could understand and enjoy it. Gabe is a wonderful representative for the NASA program. It is shame that funding isn't available to send him out as an ambassador for the NASA program. Thanks again for finding this wonderful gentleman to speak with our students. Thank you for allowing Gabe and N.A.S.A., to enter the hearts and minds of Garner students. This was a true mountain top experience for the Garner children and their teachers. I will pass along the pictures my husband took during Gabe's guest speaker's presentation. Gabe did a presentation for fifth graders at Pinewood Elementary in May. What a wonderful presentation! He did an outstanding job sharing what is happening in the space program. He also challenged students to do their best, set goals and dream. He held their attention throughout the presentation and engaged them in a question and answer session at the end. What an awesome experience for our students! They were amazed at his slide show. We appreciate him sharing his knowledge and time with us and bringing along "goodies" for the students. Gabe Gabrielle gave an outstanding presentation to the teachers who attended the Sun Åen Fun Aerospace Educators' Workshop last Saturday, April 25, 2009 in Lakeland, FL. His enthusiasm and knowledge of the space program is incredible. His positive attitude and outlook on life are truly remarkable and he shares all of this with his audience. The forum tent was filled to capacity and the teachers really enjoyed the presentation. Thank you so much for allowing him to speak and for the NASA materials he shared with those attending. We had a fantastic workshop and Gabe contributed so much to the success of the entire day. I am writing to give feedback on a presentation that Gabe gave for our students. I work for a non-profit organization called Breakthrough Collaborative, which helps junior high students from low-income families excel in school. Gabe was our keynote speaker and we were absolutely thrilled to hear his presentation. He engaged the kid, included relevant examples, and most importantly he emphasized the difference between dreaming about doing "cool" things and actually setting goals and charting a course to realize them. We, including the teachers, were very inspired by his own stories of struggling with school and working with children in South Africa and were excited to learn about the current events with NASA. We are exceedingly grateful for the time that Gabe spent in order to share with our kids (a three hour drive each way, an hour presentation, bringing goodies for the kids, missing work, etc. ), it was a fantastic experience and the kids are still talking about it- definitely a highlight of our summer program. I just wanted to let you know how much we enjoyed Gabe speaking to our elementary school about NASA. His presentation was very 'kid' friendly and interesting. The items sent for the students were icing for the cake! They were thrilled and I observed a 'new' type of play at recess. Instead of playing 'gangsta' they were flying to Mars. Gabe motivated them to think beyond today. Gabe Gabrielle gave an outstanding presentation to the teachers who attended the Sun ‘n Fun Aerospace Educators' Workshop last Saturday, April 25, 2009 in Lakeland, FL. His enthusiasm and knowledge of the space program is incredible. His positive attitude and outlook on life are truly remarkable and he shares all of this with his audience. The forum tent was filled to capacity and the teachers really enjoyed the presentation. Thank you so much for allowing him to speak and for the NASA materials he shared with those attending. We had a fantastic workshop and Gabe contributed so much to the success of the entire day. I really want to thank you for allowing George " Gabe" Gabrielle to visit with our student on May 26, 2009. It was such a delightful and informative presentation. Both students and faculty alike enjoyed it. Gabe did a wonderful job. The videos and photos were awesome. I know that he has helped spark the aeronautic desire in many of the students. Thank you again for our presentations, as I know all will remember for a long time. I wanted to take a minute to drop you a line and let you know how much I appreciated having Gabe here at our school. He did a great job and was very eager to be here. He really has a heart for the kids. Thank you for allowing his visit. I would like to thank you for allowing Gabe to come to Garner Elementary and present information regarding NASA and the space program. The students really enjoyed the pictures, slideshow, videos, visuals, question/answer time, and the goodies. Gabe was very good. I really appreciate him coming here. Our kids asked a lot of questions in the high school and he kept their attention very well. He also sent a lot of handouts and goodies for the kids which was a wonderful gesture. I am very thankful to you Jennifer and to you Tara for working above and beyond the call of duty to gather all the materials from NASA so quickly to enable Gabe to bring gifts to Garner's students and staff. Garner is a multiethnic school. Garner is a title one school Most of the student body live in extreme poverty. Gabe's visit to Garner was the first in the lifetime, mountain top experience for our students. I know Gabe opened the window to a door that most of the students never knew existed. Thanks to the two of you, each student now has a memento gift of Gabe and N.A.S.A. Thank you for this incredible opportunity, and all your hard work. I want to thank you so much for sending George Gabrielle to Boyette Springs Elementary School to talk about the future of the space program. Any school you send him to would be lucky to have him as their speaker. His presentation was very well organized and was met with incredible enthusiasm and interest by all 3rd, 4th, and 5th graders. He handled all the students' questions with expertise and thoughtfulness. He also showed he is compassionate and caring with his positive messages about dreams and goals. He also built a positive rapport with an autistic child allowing him to be his "personal assistant" and help him with his slide and video presentation. He made a huge impact on a child who already has many obstacles in life and was made to feel important in front of all of his peers. I have had many compliments from the teachers, students, and parents who were lucky enough to participate in his program. He was a great ambassador for NASA and has surely inspired many young minds to continue their education in math and science. He encouraged them to be all they can be and "reach for the stars"! Thank you again for sending Mr. Gabrielle to our school. I am in Mrs. Quinones 5th grade class at Boyette Springs Elementary. You came to talk to BSE's 5th grade to talk about NASA. I really enjoyed your talk- I learned alot. I especially enjoyed the song " In the Jungle" with the video. We all thought it was hilarious. I learned how hard it was to put the space shuttle together. But it did look like fun being an astronaut- especially drinking water when weightless. Our school was fortunate enough to have a guest speaker, Gabe Gabrielle, from the Speakers Bureau on September 19, 2008. I would like to express our gratitude and let the bureau know what an outstanding presentation Mr. Gabrielle gave. He was very informative and the students soaked up every bit of information that he offered. We really appreciated the fact that he brought handouts for all the students in the school. Through him, many of our students and teachers alike have a renewed interest in the Space program. He continues to kindle that flame with emails from Kennedy Space Center that contain amazing images and updates from NASA, and mailing "goodies" for the students and the classrooms. While visiting our school, he took the time to interact with the students and he continues to motivate them to establish dreams, goals, and believe in themselves. He has enhanced our science curriculum by making the space program a "hands on" experience for our students. The faculty, staff and students at Upthegrove Elementary School are very appreciative of all that he has done for our school. On Friday, March 16, George (Gabe) Gabrielle, a Kennedy Space Centre engineer, addressed 270 students from various local schools in Gauteng. He supplemented his talk with the screening of "Launch your Career with Math and Science," encouraging girls to pursue careers in the sciences. He has been communicating with a local primary school since 2006 and was invited to visit the school this year. PAS Pretoria used the opportunity of his being here to gather students from approximately 14 high schools to hear him talk about the space program and the importance of education in realizing one's dreams. Result – Excellent outreach. The program exposed the students to the exciting work being done at Cape Canaveral. The short film on women in the sciences is an excellent tool for inspiring young women to pursue technical fields and features women at the Kennedy Space Center pursuing a wide range of careers, using their math and science education. Copies of the DVD, along with posters and other informational material, were given to the teachers to share with broader audiences at their schools. Thanks for a wonderful program yesterday. The kids loved you, and it was a good promotion for our planned science reading room. Thanks also for the posters, books and other goodies. Thank you, Thank you, Thank you!!!!!! Yesterday was fantastic! Both the children and I enjoyed every bit of information you had for us! I especially loved the visuals and personal stories you shared. You are absolutley right, the students were so grateful for your visit! They were thrilled about all of the goodies as well, and parents told me today that the kids came home talking all about it. They were also talking about your visit to South Africa next week. I will keep you in my thoughts & prayers as you make that wonderful journey. Gabe, we are so lucky in this area to have YOU as a dynamic resource. I will be sharing my feeings about this with NASA's speaker bureau. Thanks again for being a wonderful part of my summer camp! You are just incredible. We are so fortunate to have you assisting us with teaching the children! You have added so much to the curriculum and made it so motivating for young people. Please know that you are truly appreciated. I just wanted to let you know that Mr. Gabrielle did an outstanding job during our assembly and he came back to do another presentation for our 4-6 students. He was so informative and the students loved the presentation. We enjoyed having him here at Challenger 7 Elementary! He has been sending us wonderful website and other information about the space program. After attending your workshop at Sun n Fun I returned to my first-grade classroom excited about adding more "Florida" elements to our space unit. Your images and updates regarding space and the latest launch have been met with much exitement by the students. The night/day images of earth from yesterday prompted much discussion and allowed them to demonstrate a use of their prior knowledge from the previously studied unit. Thank you for providing or allowing Gabe Gabrielle to speak at the EGHS Junior/Senior Assembly on March 19, 2008. His presentation on NASA history and current studies was very well received by our students. The information in his speech and the additional reference material he provided were both fascinating and enjoyable. We hope that he enjoyed meeting the members of EGHS and that he will consider returning in the future. Gabe Gabrielle gave an outstanding presentation to the teachers who attended the annual Sun 'n Fun Aerospace Educators' Workshop on Saturday, April 12, 2008 in Lakeland, FL. He updated them on the latest mission and shared his enthusiasm of the space program. He also provided handouts for everyone who attended. About 150 teachers from throughout Florida as well as several other states attended the workshop. Many were regular attendees but some were there for the first time. Gabe shared so much information and gave them materials that they could go back and use immediately with their classes. They were very happy to have attended his session. We heard many wonderful comments about his presentation and we hope he will join us again next year. Please know that our committee is very appreciative of him being able to participate in our workshop. Thank you very much for all your support. I cannot, Thank You enough, for the presentation, you did here at Upper Pinellas Association for Retarded Citizens on Friday, January 11, 2008. You were wonderful with our consumers, they truly enjoyed every minute of it. It was the talk of the day around here and still this Monday morning. The respect, time and information, you gave to all will be remembered for a long time. People First of UPARC, are very pleased and thankful, they had someone like you and your program come to UPARC. I'm glad, you also came away with a wonderful experience and perspective of our consumers and that you saw them as PEOPLE FIRST, with the abilities they have, regardless of their daily obstacles. I know, you advocate for persons with special needs and I can only imagine, your visit to us has only enhanced that passion for you!